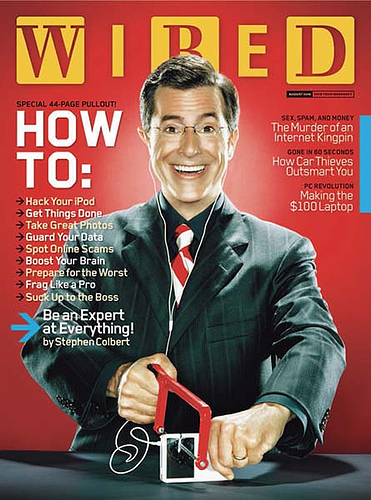 Now if you’ve never thought about The Colbert Report as a transmedia ARG, pause for a moment. What Colbert has done is promote a fictional character with a subversive agenda across multiple platforms: the TV show, multiple websites (www.colbertnation.com,www.nofactzone.net/, http://www.indecisionforever.com/). What he’s doing definitely stretches the model of the ARG (hey! wait! Is there a single model?). But it’s definitely transmedia & cross-platform and he’s had complete buy-in from his audience: he’s led an activist rally in the 2010 March to Keep Fear Alive (see its companion website,http://colbertrally.com/), and successfully solicited who knows how much $ through the contributions to his Super PAC that, as he repeatedly points out, he will not have to report on legally for an undetermined period of time. Yet this performance is only now being commented on widely as a performance: ABC news just today ran an article on Who is the Real Stephen Colbert? Colbert’s control of his performance and the media’s responses to him has been absolute and to get a sense of how he has created a storyworld in which his character exists as unchallenged, watch his September 2011 interview with Al Gore, who does the unthinkable on live TV by commenting on ‘your character.’ Colbert is clearly aghast and in character, crushes Gore with “finger quotes.” Or watch Colbert’s interview with Frank LuntzOctober 2011 on how to set up his Super PAC focus group and sell the message that Corporations are People Too. Here, Colbert slips into his highly racist Chinese character, Ching Chong Ding Dong, and says: “I’m not responsible for anything my character says.” This moment is genius as it reveals the strategy underlying Colbert’s parodic persona. That he is now raising serious debate in the US as to the validity of Super PACs, generating numerous articles and news reports is an indirect homage to the persuasiveness of his performance over time. Colbert’s application and appearance before the FEC was a fascinating moment in his ongoing ‘alternate reality performance.’ One, for Colbert, he was surprisingly monosyllabicand undemonstrative, whereas outside the hearing, he was emphatically the satiric pundit. That moment in the hearing however, raised the question of who exactly speaking before the Commission. As, if it was the character, then the legality & authority of the FEC were being mocked & challenged – technically a dicey move – yet watch him immediately after speaking outside to the press. Colbert played that moment ambiguously because he had to, but he also didn’t commit or reveal himself as the real Stephen Colbert. Colbert has used his comedic position to introduce new words to the lexicon, ‘truthiness,’ ‘anchor baby,’ and now it’s starting to look like his relentless and inventive challenge to the Super PAC might actually galvanize change. If he’s successful, I can’t wait to see what he tackles next. “In filing his initial request for an advisory opinion, Colbert sought to take advantage of an exemption traditionally used to allow media outlets to report and comment on campaigns and endorse candidates without having their work considered “in-kind” political contributions, triggering filing and disclosure requirements with the Federal Election Commission. The request came down to one essential issue: whether Viacom can legally donate production costs, airtime and use of Colbert’s staff to create ads for the so-called super PAC, to be played both on “The Colbert Report” and as paid advertisements other networks and shows.